The time and effort you spend here will be reflected in the durability of your stencils. If you’re just making the stencils for a one off then paper will be fine. 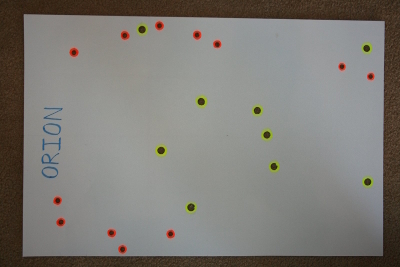 However, if you plan on using the stencils multiple times then the paper stencils will eventually need to be replaced. If you’re looking for a one off then this is the material for you. Most printers can posterize the output. 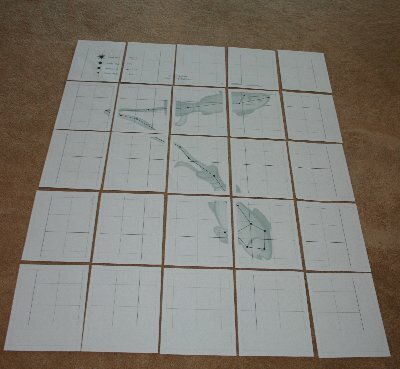 That is to say the printer can take a single sheet image and tile it over 3x3, 4x4 or even 5x5 sheets. So with some tape and a craft knife to cut out the holes you can whip up a batch in no time. 2 Ply paper and card stock. A good quality 19x24” sheet of Bristol 2 Ply will run between $1 and $2. So this is starting to get expensive. You’ll also have to transfer the stencil image by hand so they take longer to make. However, these will last for ages. Probably the holy grail of stencil material. This stuff is resistant to tearing and is just as light as paper. The only problem is finding the stuff in sheets large enough to work with. Craft shops will usually carry 9x12” sheets but making large stencils out of this stuff is expensive. If you want to go this route then the best advice I can get is to start searching for plastic manufacturers and buy rolls of the stuff directly from them. Making Stencils From Letter Sized Templates. This method demonstrates how to construct a stencil using the templates printed out on a single letter sized piece of paper. This demonstration is performed using card stock but you could substitute Mylar or another suitable material too. Card Stock of the size that you want to create. Ruler and long straight edge. Circle Cutter. You could use a craft knife here too. Ok so here's an image of your starting tools. The scale I usually use is one large square = 1 foot. The grids you see on these images are drawn using a 1/2 foot resolution. So there are four smaller squares in each larger square. The card stock I used for these stencils were 19X24". So I decided to make 8" squares. So with your card stock draw out the grid and then carefully transfer the image. I used 10mm holes for the small stars and 15mm holes for the large stars. Cut the holes out with a circle cutter or a crafting knife. Now these are not the size of the stars you will create. They are large enough to enable you to pop a 3D star into the hole and not get paint on the stencil. Here's a partially completed stencil. When finished use an eraser to remove the pencil marks and a highlighter and color the large and small holes different colors. 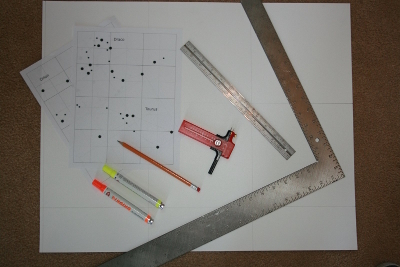 This will help you identify the star locations and sizes when painting. I actually then draw in the constellation lines between stars but you don’t have to. Now the major benefit in using the stencils is that you can place them on the ceiling using tape and then just move them around until you have them where you want. Once they are where you want them just paint stars into the exposed holes. So when you're finished using your stencil DO NOT attempt to remove the tape. Just fold it over the edge and cut through any holes that get covered by the tape. If you try and remove the tape you will probably tear your stencil. The tape will also add some strength to the edges of your stencil. This method shows how to create a stencil from a tiled template. A tiled template is one that has been printed out using any tool that can print an image over multiple pages. I do this using PolyView, where I have fine control over the final image size. Most HP Printers also offer what they call a “Poster” printing option where you can choose to have the image printed over multiple pages. This method saves you from having to transfer the image by hand but only works well with translucent materials such as Mylar. Mylar. I buy this in 36” x120’ rolls from a distributor of R&B Converting. Tape to stick your tiled template together. First you’ll need to print out the template at the size you need to create the stencil at. If you’re using an HP printer you can choose to use the “Poster” option. If you need finer control use a graphical application that provides this capability. If you’re using an HP printer then you can access the poster option in the printer preferences when you print the template. See below I have chosen to print the image using a 3x3 output. 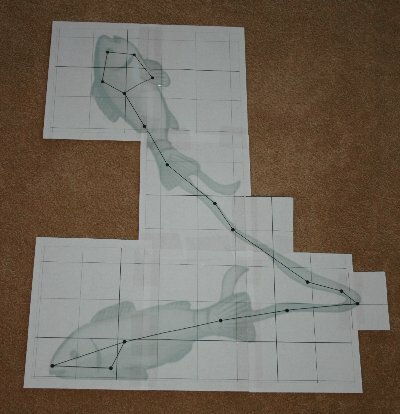 For this example I printed Pisces using PolyView. I chose a rather large output which printed the template at 5 pages wide and 5 pages deep. The next step is to cut and stick the template together. Now cut out a sheet of Mylar to cover the template. Ensure that you leave about an inch border to so that tape does not interfere with the holes when putting it up on the ceiling. 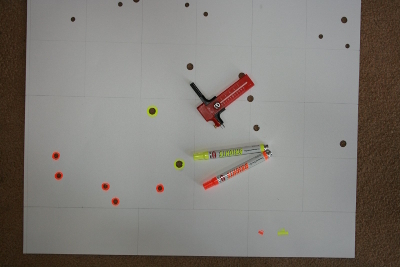 Place the Mylar over the template and mark where the holes need to be cut. OK yes this is Scorpius not Pisces but I needed a smaller image to photograph for these stages. Finally use the hole cutter to cut out the holes. These Mylar stencils will last a very long time. They are certainly worth the effort if you plan on painting multiple rooms or starting a business.